Oracle’s Application Implementation Methodology is a proven approach to implement Oracle Applications. AIM defines an organization’s business needs at the beginning of the project and maintains their visibility through out the implementation. 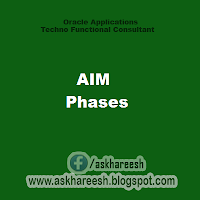 AIM project is conducted in phases. The phases provide quality and control checkpoints to coordinate project activities that have a common goal. 1) Definition: During this phase, we plan the project ,review the organization’s business objectives ,understand the business processes and evaluate the feasibility of meeting those objectives under time, resources and budget constraints. The emphasis is on building an achievable work plan and introducing guidelines on how the organization will work to achieve the objectives.To achieve an early understanding of current business operations and future processes,the team also performs baseline and process modeling during this phase.If business change is required,then the high level future process designs are drawn.The goal is to identify the future business and system requirements,propose a future business model and determine the current application and information technology architecture.The information gathered provides input to the downstream activities in subsequent phases.All business requirements are associated with planned future business processes.So sharing an accurate understanding of the requirements is a critical success factor to the project. 2) Operations Analysis: The project team develops the business requirement scenarios based on deliverable drawn out of the definition stages.These business requirement scenarios are used assess the level of fit between the detailed business requirement and standard application functionality.Gaps are identified and new proposed solutions are developed.Proposed solutions for gaps evolve into detailed design during a solution design phase. 3) Solution Design: The purpose of the solution design is to develop the detailed design to meet the future business requirements. 4) Build:The coding and testing of all customizations,data conversions and interfaces are done in this phase.Business system testing is performed to validate that the functionality meets the business requirements.If customizations,extensions and conversions are not required ,build phase is still important because it includes business system test..In conference room pilot(CRP),the business system test validates the new system in an environment that resembles the production. 5) Transition: During transition,the project team deploys the new system into the organization.All the elements must come together to tranisition successfully to actual production.During transition users perform an acceptance test of the new system. 6) Production: It marks the last phase of the implementation and the beginning of system support cycle.